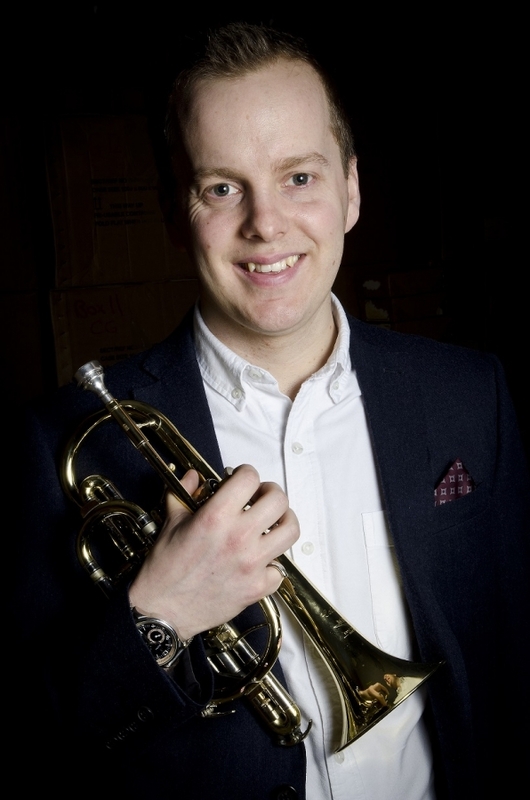 Nick started playing the cornet at around the age of 7, under the tuition of his grandfather and previous GUS principal cornet, Michael Barratt. He grew up playing in the Salvation Amy at Kettering corps alongside James and Thomas Fountain. At the age of 15 and in his final year of the course he was appointed principal cornet of the Salvation Armyâ€™s territorial youth band. Nick was also Principal cornet of the Northamptonshire County Youth Brass Band. He went on to gain a place at the Birmingham Conservatoire School of Music where he was tutored by Richard Marshall and Ian Porthouse and was principal cornet of the college band. Shortly after his time in Birmingham he made the decision to audition for Her Majestyâ€™s Coldstream Guards Band. He was accepted and has enjoyed the last four years as a proud Coldstreamer performing at many high profile engagements, including the Queens Jubilee concert with Robbie Williams, as well as successful concert tours of Japan, Switzerland and Germany. During his first couple of years in London Nick had some time out of GUS and had the chance to guest with other brass bands such and Grimethorpe, Cory and Brighouse. Nick is now based in London as a member of Her Majesty's Coldstream Guards Band. He enjoys performing at many high profile engagements across the UK with the band, as well as successful concert tours of Japan, Korea and China, where he has performed as a soloist. He has also moved onto the Flugel seat at GUS, another seat previously occupied by his grandfather, Michael. During this time the band has won three back-to-back area championships and one All England Masters title. Nick also features as a soloist in their concerts up and down the country.